EXTRAORDINARY Guest: Thanksgiving Party & Free Printables. I am so thrilled Desirée asked me to come share with you today! There is so much fabulous inspiration on the site and I am honored I can be a part of it! I am Kori from Paper & Pigtails. and now design everything from cupcake toppers to favor boxes! Over at the blog I share everything from real parties, to party ideas, and inspiration. I am so excited to share my Thanksgiving Party Shoot with you all today! Here is the concept. I decorate my home for fall. I add “touches” of design to make it more Thanksgiving. When I host a party….I always start by looking at what I have around my home to decorate with so that I don’t have to buy and store a ton of party supplies that are used just for that day……..and that’s where this idea came from!!! I designed a party that would use the “decorations” I already had in my home and add in a few extras to host a lovely Thanksgiving Get Together!! 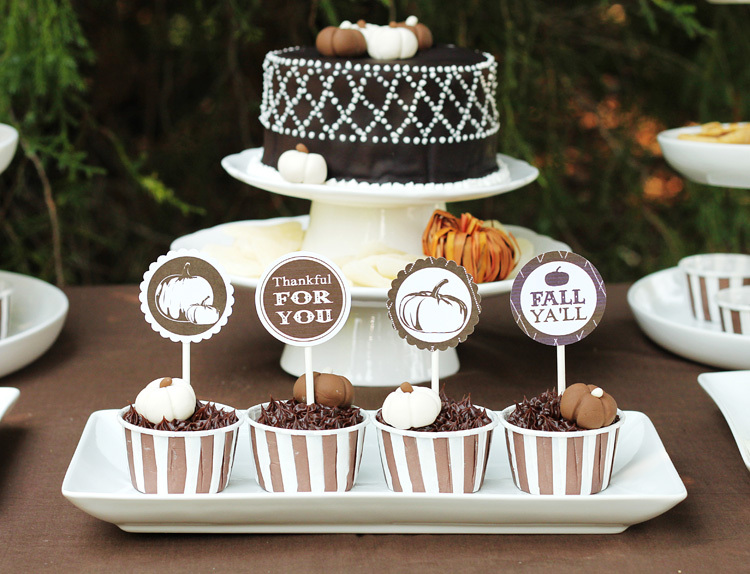 The look and simplicity of white pumpkins combined with a chocolate color palette is so appealing this time of year! I used paper doilies and paper pumpkin cut outs to create very effective and inexpensive table runners! you better be sure I will be packing up these pumpkins so I can use this design where ever we are! Here is the Thanksgiving table!! And of course a staple at every party around this house….a KIDS TABLE! With a sweet creamer dish to hold crayons, and white pumpkin cut outs to color on, the kids are sure to have fun waiting for the sweets to be served! I hope you enjoyed the inspiration shoot and I really HOPE you enjoy the free printable Signs and Circles to use in the upcoming Holidays!!!! I have such happiness in my heart just thinking of the season ahead with family and friends! DOWNLOAD YOUR FREE PRINTABLES HERE!! Click below to find the Fabulous Extras ! This Thanksgiving Party is so pretty! Thank you so much Kori for sharing your precious pictures and the awesome PRINTABLES! Please take a minute to visit Kori’s blog Paper & Pigtails…. I am warning you I can spend half of my day there! PreviousEXTRAORDINARY Guest: Washers and Wood Beads Necklaces. Wow! What a beautiful dessert table. I think I would be tempted to skip the turkey and head straight for the sweets! Thanks so much for the great ideas and especially the adorable printables. Thank you so much for sharing my Thanksgiving party ideas! I love your blog and am happy to be able to take a little part in it! Thank you so much for sharing your party with us! So sweet. I love the suggestion to look around home and reinvent instead of buy, buy, buy. My wee one would look like an angel in that little t-shirt. Must make one soon.